Tucson is a drinking town. In the wild-west days, this town was a place to stop, get a room and find a rowdy saloon to cool your heels before heading back out on the dusty trail. In the mid-20th century, folks came from all over to marvel at the desert and cacti and let loose in a hideaway bar that served stout exotic cocktails as the kids frolicked in the pool under funky neon signs. Today, Tucson is the known American city of gastronomy and with it comes a few visionaries keen to continue our tradition of culinary greatness by bottling some of the best booze in the world. It just seems obvious they would. We have the space, but most important we have the demand for quality libations. 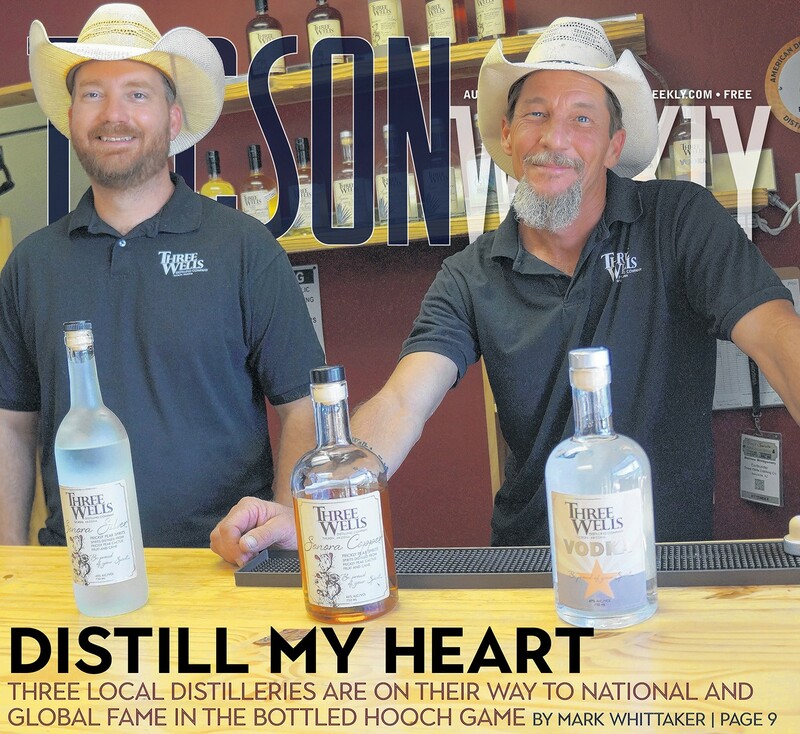 Hamilton and Three Wells are both fairly new to the distilled-spirit game, but in the brief time they've been operating, they've earned the attention of bars, shops and restaurants across Arizona, the country and (we'll project) the world. Best part is, they do it locally and do it on their own terms. Before he made whiskey, he made furniture. For more than 30, years Stephen Paul ran the company Arroyo Design, which utilized mesquite wood, and at the end of the day, he would take scraps home with him for the barbeque. "I always said to myself, 'those are our profits going up in smoke,'" he says. Paul smiles in the large expanse of the Hamilton Distillery in an industrial area just off Grant Road and the I-10. "Then my wife asked me, 'Why can't you just dry malt over a mesquite fire instead of a peat fire like they do in Scotland?' So that got me thinking. We are both big Scotch drinkers, so I started learning how to distill whiskey. I had no idea what I was doing. Eventually I learned how to malt because you can't buy mesquite smoked malt anywhere." That unique flavor began to catch on and by 2011 the Paul family graduated from small batches to a 40-gallon still. To do that, they had to get legal. See, it's illegal to distill sprits at that volume unless you have the proper forms to back you up. 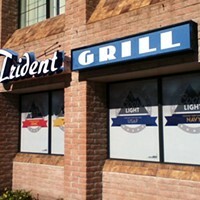 Eventually, they got the permit, and in 2013 they took their product to the Tucson market where it was warmly received. It is easy to see why. Their Del Bac whiskey has so many unique characteristics to it, making it a rather complex yet somehow familiar spirit. This is sipping whiskey at its finest. "I will admit the transfer from furniture to whiskey was a tough one," Paul says, as his distillers Nathan and Ramon check temperatures and get barrels ready to house future product. "But it has been worth it." It didn't take long for others to see, and savor, the bottled magic they were producing, and before long they got the funding to graduate to a 500-gallon still. And that's when things began to really take off. What started modestly here in Tucson, Del Bac began to spread like a summer wildfire across Arizona. From there the demand was so rampant, they now call 12 states home. In fact, New York, Conneticut and New Jersey are such fans of Hamilton's whiskey, tastemakers began to take notice. Earlier this year Esquire magazine named Hamilton one of the best distilleries in the country before Forbes gave Del Bac the nod as one of the best American craft whiskeys to give for Father's Day. Mighty impressive for a guy who once made furniture for a living. The process to make whiskey is long and complicated. And it can't be considered a whiskey if it's not barrel-aged. Thing is, Hamilton has a "clear" spirit, made from the same grains and growth that go into their other products, but it's an entity unto itself. More, there's a cozy tasting area in the back of the warehouse where you can sample the goods. Tail-wagging dogs and purring cats greet you there. It's like you're visiting Paul's family cabin. And that setting makes sense because their multi-award-winning classic whiskey is divine. With hints of honey and caramel, this unsmoked version is an obvious choice for dad, or anybody, on their special day. It's easy but with a good bout of vibrant intricacy on flavor and scent. The Dorado is almost like drinking liquid bacon, and that is a definite good thing. One can get hits of tobacco, dark chocolate and even a campfire as you slowly enjoy it. The clear product is a beast though. You can compare it to mezcal, but that is doing it a disfavor. Pouring a bit of water into it develops the essence into something wholly unique and should only be described by your nose and tongue. "Del Bac is actually two languages," Paul says. "'Del' is Spanish for 'of the' while Bac is native O'odham, meaning 'the place where the river meets the sand. ' You throw whiskey in there, and we are a tri-lingual name. It was inspired by the San Xavier Mission ... another idea by my wife." "Prickly pears just grow wild here, so I thought ... why not make booze out of it?" The wife of Matt Montgomery, Three Wells' distiller, eats the cactus fruit right off the plant. Out on Sahuarita road, where they live, the stuff is more than plentiful. After a lot of trial and error, their signature Sonoran Silver was born, a fruity spirit in the sense of a brandy, but it's not a brandy. It is ... something else. If you've ever had the local produce that grows wild here in late summer, imagine that flavor but masterfully distilled and made into alcohol. That's right. You're welcome. Three Wells is a classic tale of small beginnings and big dreams. Montgomery was a contractor during the housing boom and shared a taste for expensive tequila along with his sister who lives up in Phoenix. Together they would swap bottles, but when the market crashed Montgomery went from paid to dismayed. Buying expensive tequila was suddenly not in the budget. "Then I thought 'How hard could it be?'" Montgomery says on making his own booze. With his friend, and now business partner, Chris Dudding—who's also a trained chemist working for a Fortune 500 company—they began to experiment in Montgomery's garage. "Oh those first batches were bad," Montgomery laughs. "But then we started to get better and after a while we got some whiskey that was palatable. Then I started training myself on distilling, and even to this day I am still learning." After lots of paperwork, they went from a garage to their current location on South Alvernon Way—which shares a parking area with Ten Fifty-Five Brewing. Three Wells opened their doors, and bottles, in October 2015. Named after the third well in the distilling process (where water is added), Montgomery and Dudding suddenly found themselves with a viable business. "Even after all the attention and demand, we are still operating in the red," Montgomery says, leaning on the bar in their small front tasting room. "We need to sell thousands of units to get in the black. Someday we hope." You can find their products across Arizona. And that's where it comes from. Just like the prickly pears, Three Wells incorporate products solely from the Sonoran Desert. They use locally harvested corn for their vodka and the juniper berries for their gin are plucked from Mount Lemmon. It's impressive how these two guys in cowboy hats can execute that much distilled glory in such a small space. "We are working on statewide distribution," Dudding says, "But with the space that we have that's going to be a challenge. We are definitely in the works of getting a larger space." They talk of a bar somewhere downtown, and a new bourbon to add to their already heady line of award-winners. The equipment for the bourbon is currently being built. When the new distilled spirit hits shelves, you can believe that it will be as hotly embraced as their vodka, gin and prickly pear Sonoran Silver and Copper. This article originally included inaccurate information about a third distillery that has been removed.